Coordinators: Georgas James, Weiss Lawrence G., van de Vijver Fons J.R., Saklofske Donald H.
D.H. Saklofske, L.G. Weiss, A.L. Beal, and D. Coalson, The Wechsler Scales for Assessing Children's Intelligence: Past to Present. J. Georgas, Cross-Cultural Psychology, Intelligence and Cognitive Processes. L.G. Weiss, The WISC-III in the United States. J. Gregoire, France and French-Speaking Belgium. M. Schittekatte, W. Kort, W. Resing, G. Vermeir, P. Verhaeghe, The Netherlands and Flemish-Speaking Belgium. P. Rossmann and U. Schallberger, Austria and German-Speaking Switzerland. K. Sonnander and B. Ramund, Sweden. G. Gintiliene and S. Girdzijauskiene, Lithuania. D. Boben and V. Bucik, Slovenia. J. Georgas, I.N. Paraskevopoulos, E. Besevegis, N. Giannitsas, and K. Mylonas, Greece. K. Ueno and I. Nakatani, Japan. H.Y. Chen, Y.H. Chen, and J. Zhu, Taiwan. F.J.R. van de Vijver, Principles of Adaptation of Intelligence Tests to Other Cultures. F.J.R. van de Vijver, K. Mylonas, V. Pavlopoulos, and J. Georgas, Methodology of Combining the WISC-III Data Sets. J. Georgas, F.J.R. van de Vijver, L.G. 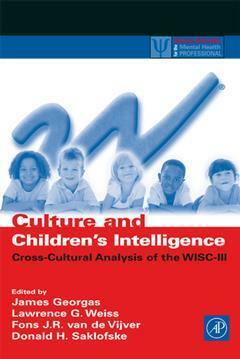 Weiss, and D.H. Saklofske, A Cross-Cultural Analysis of the WISC-III. School psychologists, clinical psychologists, neuropsychologists, special education teachers and evaluators.